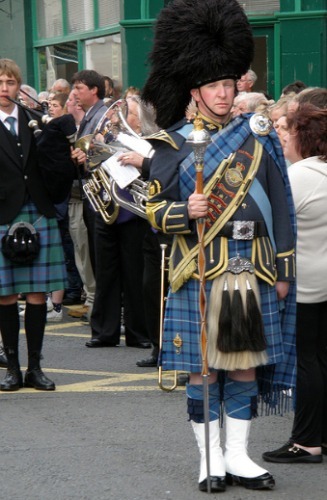 Full Highland Dress is most commonly seen at formal occasions, such as dinner or the theatre for example. And probably in the last twenty five years, it has become the most favoured Celtic wedding outfit, for both the Bridegroom and many of the male guests. It is the Scottish version of the Dinner Jacket, and is evening wear at its finest. So what is considered full Highland Dress? Well naturally you start with your kilt, to which you add a winged collar white dress shirt, and black bow tie. Your kilt pin incidentally would be worn on the apron of your kilt. Then comes your Prince Charlie kilt jacket, this is the most elegant of evening wear. 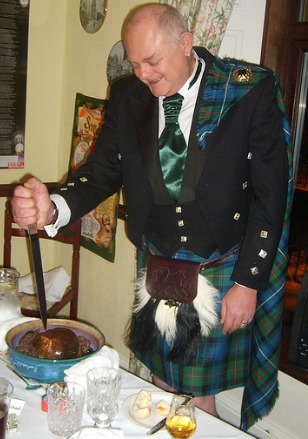 Below you can see a photo taken at a Burns Supper, showing the Gentleman wearing full Evening Dress. Add to that your kilt hose, which incidentally should not be white (only pipe bands wear white hose). 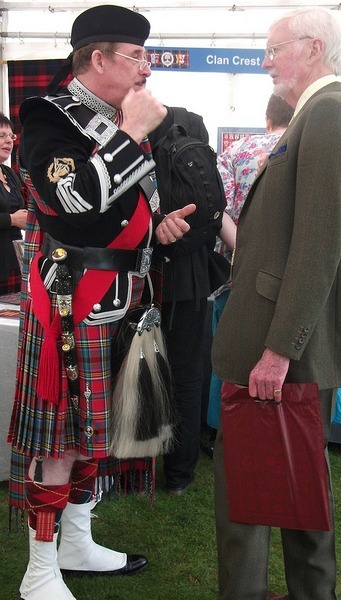 On your kilt hose you would be wearing your flashes, which can either match or contrast with your kilt's tartan. On the next photo you can see contrasting flashes. Tucked into your kilt hose, you would wear your Sgian Dubh, your ornamental knife. As you can see below when a uniform is worn, a dirk is often worn with it, traditionally on the right hand side. That then leaves your kilt shoes, and for evening wear the most widely worn are the Ghillie Brogues. One other item that can be worn to finish off your outfit is a full plaid. Now this is not to be confused with plaid, which is how both America and Canada refer to tartan. No the full plaid is a length of tartan (usually the same tartan as the kilt) which is traditionally worn by pipers who elect to wear full military styled uniforms. Below you can see a photo of a piper wearing just such a uniform. The plaid is wrapped around the wearer's chest, and under the right arm with the excess material being thrown over the left shoulder. Traditionally only clan Chiefs, Commanders of military regiments and their wives, are permitted to wear their plaids over their left shoulder. 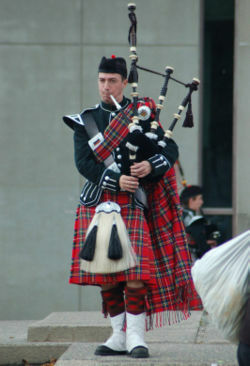 Pipers are an exception to this, from a practical point of view the plaid being worn over the left shoulder does not interfere with the shoulder straps of the pipes. If you or I chose to wear a full plaid as part of our full dress outfit, we would be expected to wear it over our right shoulder, in order to be "correctly" dressed. So that covers your outfit, now you only have to decide on which occasions you will wear it, to show it off in all it's elegance.